Darien coach Rob Trifone and Shelton coach Jeff Roy shake hands following the CIAC Class LL Championship football game in New Britain, Conn. on Dec. 12, 2015. Darien won 39-7. 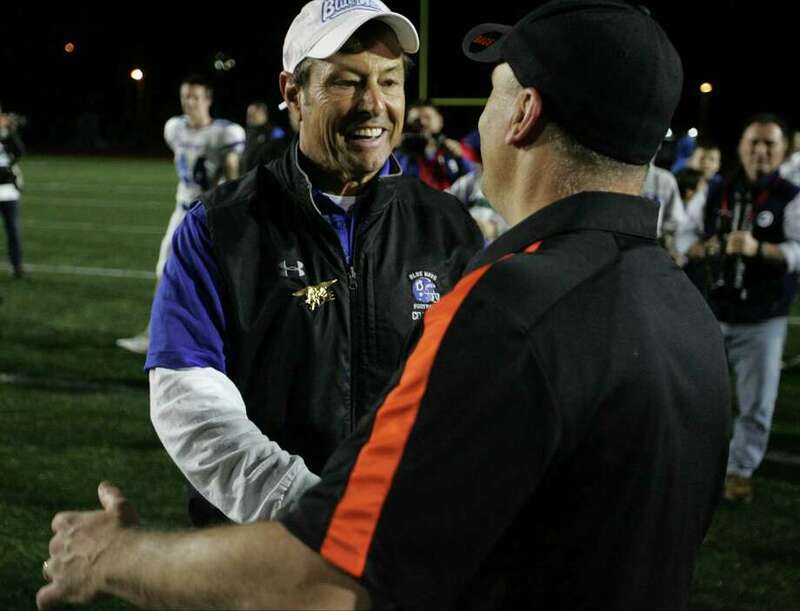 DARIEN — During his historic 2015 football season, Darien coach Rob Trifone remarked he has the best job in the world. As a teacher at Darien High School, Trifone has the rare opportunity both to mold minds in the classroom as well as on the gridiron; something he has done with great success. After completing a remarkable undefeated season in which the Blue Wave won the FCIAC and Class LL titles, Trifone has been named Hearst Connecticut Media’s Super 33 Football Coach of the Year. The honor comes a week after the Walter Camp Foundation named Trifone the state’s coach of the year. Those players included his twin sons, Bobby and Christian, as well as the likes of Hudson Hamill, Timmy Graham, Shelby Grant, Colin Minicus and Hearst Connecticut Media’s MVP Mark Evanchick, all of whom he has coached since they were third-graders playing in the Darien Junior Football League. Because of the success on the field, and the bond with the players off it, Trifone says 2015 is the most special of his 37 years as a football coach. Hamill, said winning was not only special to the team, but as a sense of pride to raise Trifone into the upper echelon of coaching. Another less likely source of pride came from an opponent in Staples coach Marce Petroccio, someone who has been around the FCIAC and Trifone for more than two decades. Trifone’s Wave knocked off Staples twice in 2015; first to reach the FCIAC title game and then again in the state quarterfinals. Only one team, No. 2 New Canaan, gave Darien a competitive game; a 28-21 Darien win in the Turkey Bowl for the Wave’s second consecutive FCIAC championship. More impressively, Darien halted Southington’s 31-game win streak with a 49-7 drubbing in the state semifinals before taking down Shelton 39-7 to claim the Class LL crown in just the Blue Wave’s first year in that division. Asked the seemingly obvious question if 2015’s team was the best he ever had, Trifone had one more that came to mind before giving his answer. But it isn’t just about accolades and trophies for Trifone. Anyone who has come across the coach knows he’ll accommodate anyone for the betterment of the program, whether it be the press, family members or a friend of the school. Trifone does everything he can to make sure the brand that is Darien football carries as much weight as possible. It should — he’s earned it.